Lenny Dantinne had a strong reaction when he got an MEA email announcing our big win in the 3 percent case just before the holiday break in December—and it wasn’t only about the money his two-teacher household would be receiving back. “I felt completely vindicated, because we had been battling Governor Snyder on something that was ours from the very beginning,” the Millington educator said. That day—Dec. 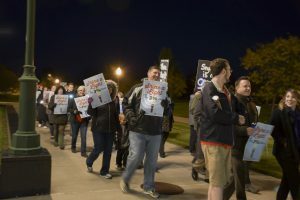 21—as word spread across his school that the Michigan Supreme Court had ruled to return the 3 percent to school employees, “There was such a sense of relief that justice had been served,” said Dantinne, an 11-year teaching veteran and president of his local. 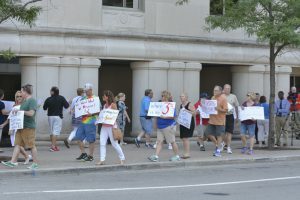 That elated sense of justice might have been deeper for custodians, paraeducators, cafeteria workers—support staff who make hourly wages and may have felt the loss of income even more keenly than teachers, said Marty Petrich, a bus driver for the Eastern Upper Peninsula Intermediate School District. For seven years, MEA, AFT Michigan, and AFSCME fought for the return of more than $550 million seized from the paychecks of about 275,000 Michigan school employees between July 2010 and September 2012. The state unilaterally took the money to pay for retirees’ health care, even though current employees were not guaranteed to receive the benefit. Lipscomb, a longtime Saginaw math teacher, said the speed of the Supreme Court’s 6-0 ruling in the case underscores what a shame it was for Gov. Rick Snyder to spend nearly $400,000 to pursue his last appeal after losing in three earlier rulings. “That taxpayer money he wasted could have gone toward education,” Lipscomb said. It’s why the single mother of two chose to stay in the union after Republicans rammed the so-called “right to work” bill through the Legislature in 2012. The daughter of a teacher, Lipscomb remembers walking picket lines with her father in the 1960s and 70s. “If we stay together and work together as a union, it’s not just about benefits for teachers, it’s about what we’re going to be able to give the kids,” she said. 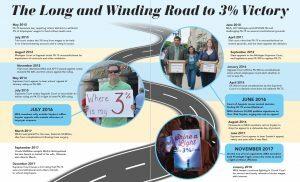 Michelle Frost similarly hopes the 3 percent win will bring the less visible work of MEA into the forefront for many members. The 22-year elementary school teacher is a building rep and bargaining team member at her school in Saginaw Township. United we stand—and win—and divided we fall, agrees John Lusk, an English and journalism professor and past president of his local at St. Clair Community College. Good litigation is expensive—too costly for an individual to sustain for seven years, he said. Getting back earnings of hundreds or thousands dollars will be welcome relief to higher education employees who have experienced falling salaries and wages over the past several years, along with increased health care costs, just like their K-12 counterparts, Lusk said. He planned to spend his refund on repairs to keep his car running. Others listed plans for the money that included college tuition for themselves or their children, home repairs and appliances, retirement savings, and long-deferred vacations. Crystal Willit, a secretary at Monroe County Intermediate School District and president of her support staff association, hoped to receive her refund in time to plan a spring break vacation for the first time ever—“somewhere warm so I can put my toes in the sand,” she said. 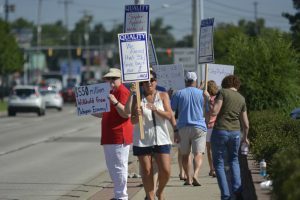 Derrick and Tami Oxley, both educators in Hillsdale County, expected to use the returned wages to pay bills. Both are working on master’s degrees, so tuition adds a lot to their family’s expenses. But their three young children had different ideas. As a retired teacher living on a fixed income since 2013, Sharon Fielder said she would put the money in savings—and the rainy day fund would be a constant reminder of the strength in numbers that MEA represents. “The right thing happened in this case, and it wasn’t because state officials realized they took our money illegally and decided it was the right thing to give it back,” Fielder said. “MEA fought long and hard to prove multiple times the state had no right to take our money. I am so appreciative of the MEA fighting the good fight for this one. However, I have another question/problem: our district continued to take 3% of our pay from our checks from Sept. 4th, 2012 to Feb. 1st, 2013. I have read conflicting information regarding this money. For those folks who opted to go to the 401k plan, they are supposed to have their money in their accounts. But for those who elected to be a part of the retiree health benefits, they don’t get this money back? this makes no sense to me? Why would I pay for something 5 months before I had to? What do I get for my money? Basically, I have paid for something that nobody else had to pay for until Feb. 2013. What gives? I want my money back for those months! How do we make this happen? Help MEA!